John Wesley used to say that he thought very little of a man who did not pray four hours every day. Wow! Wesley would not think much of me. I did a little search to see what else I could find about John Wesley’s prayer life and thoughts on having regular prayer time. Here’s he best description I found. John Wesley would rise up at 4 AM every day to seek God for the first four hours of the day. In his later years Wesley was known to spend up to 8 hours in prayer. 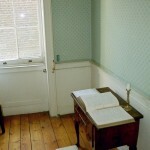 The Seeking Disciple also had a picture of Wesley’s prayer room, which I have included in this post. In today’s church climate, where ministers devoted to the Word and prayer are valued less than ministers who can design the best ministry systems and run the staff effectively, it is difficult for a young minister to see John Wesley as a model for ministry.